Last Thursday at Lincoln Performance Hall, the line to pick up tickets for Éowyn Emerald & Dancers’ performance ran across the lobby, down a partial stairwell and up the other side, like a restless snake shifting and stretching in the midday sun. Eventually the crowd slithered into the theater’s 450-plus seats, packing the place with people eager to see the company’s final show of contemporary dance in Portland and give it one last cheer before Emerald & Co. move to Scotland, where they’ve scored enthusiastically reviewed successes during two recent appearances at the annual Edinburgh Fringe Festival. 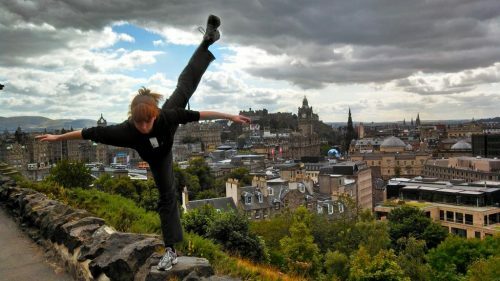 Emerald, on top of the world in Edinburgh for the 2014 Fringe Festival. As it happens, the first piece I wrote for ArtsWatch, back in January 2012, was about Emerald’s first show in town as a choreographer, at BodyVox, where she’d been dancing with BodyVox-2. Now here I was again, with a lot of other people, to witness her farewell gig in town. An eagerness bubbled in the crowd, a sense that a fresh contemporary voice was moving on to new things, and ought not be let to slip away without a warm farewell. Emerald’s eleven dances, which were performed variously to music by Duke Ellington, Claude Debussy, Trent Reznor, Alt-j and others, and which dated from this year all the way back to 2002, when she was a high school junior, were swift and energetic and revolutionary, in the sense that revolving, in fluid turns sometimes punctuated by leaps or slides, was a near-constant. The work, which was performed mostly barefoot and which reveals a ballet heritage as well as more contemporary impulses, has humor and a strong romantic bent, and what struck me throughout was the fluidity of the romance, moving easily and without comment through various gender combinations. 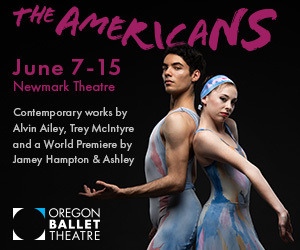 For her oldest piece Emerald added several talented high school dancers who have been her students; the others featured such accomplished hands as Anna Marra, Josh Murry-Hawkins, Mari Kai Juras, Brent Luebbert, and Sarah Fuhrman. One sign of Emerald’s ease with both dance and contemporary culture is that her movements for men are at least as vivid as her movements for women, toward a casual yet firm equality of possibilities. In that sense, at least, these seemed like dances for the future – a future, it seems, that will find its next steps in Scotland. May the ground prove fertile and the welcome warm. PRETTY CREATIVE. While Emerald’s leaving town, a lot of other dancers and dancemakers are coming in, at least temporarily. 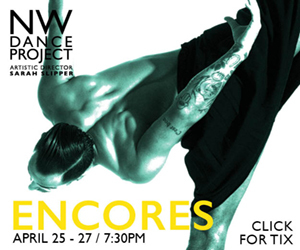 One of Portland’s more interesting annual dance events is NW Dance Project’s Pretty Creatives, an international competition in which Sarah Slipper’s contemporary company chooses choreographers to work on new pieces with the company and the dancers who gather from all over for its annual LAUNCH workshops. 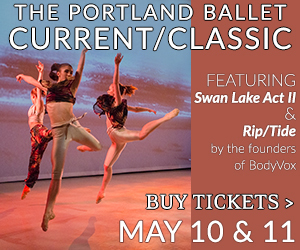 It’s a natural for NDP, whose main focus is performing new works by national and international choreographers who create their pieces in Portland. This year’s winners are Alice Klock and Alysa Pires, who’ve been working with NDP and the 31 dancers gathered for this month’s LAUNCH. The pieces they’ve created will be performed Saturday evening at Lincoln Performance Hall. 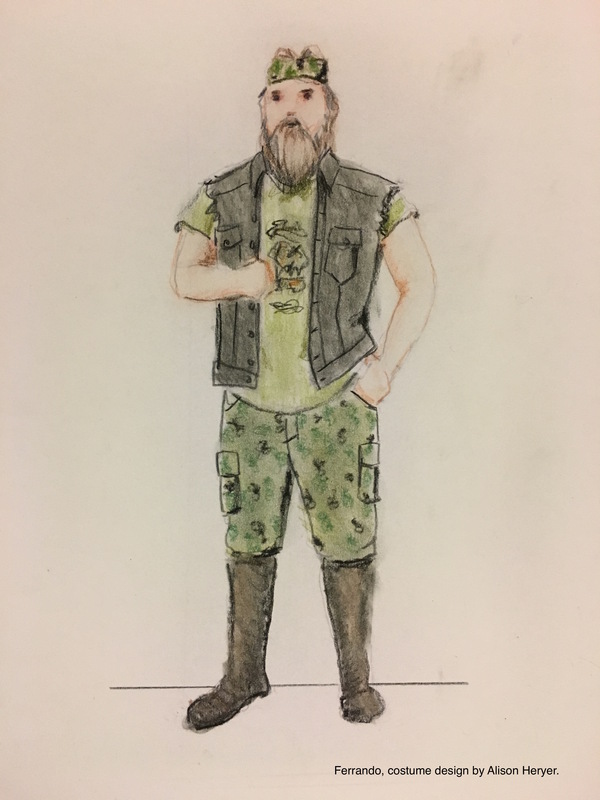 Alison Heryer’s forest-disguise costume design for Ferrando, played by Aaron Short. Deception Unite. This new piece from PETE – the Portland Experimental Theatre Ensemble – wraps up the 2017 CoHo Summerfest. 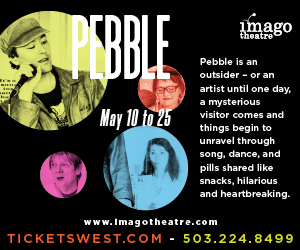 It’s always tough to describe a PETE show before the fact, so we’ll let the company do it for us: “Kitchen sink realism is slowly suffocated with a pillow of subtext, and the narrative goes into witness protection. 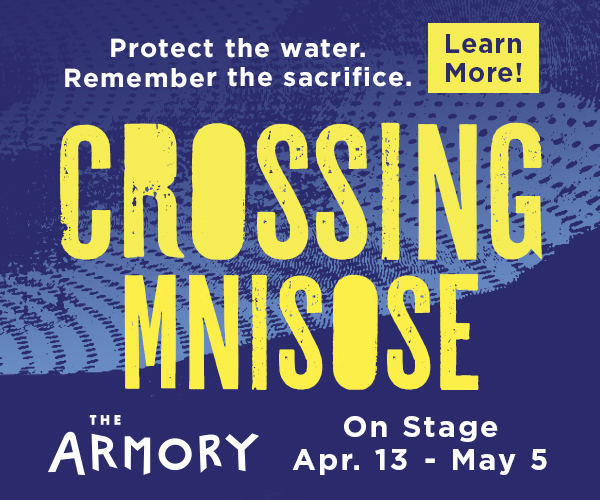 A fake Polish punk band takes over as the protagonist, but whoever’s been translating their lyrics is deeply unreliable.” Thursday-Sunday, CoHo Theatre. 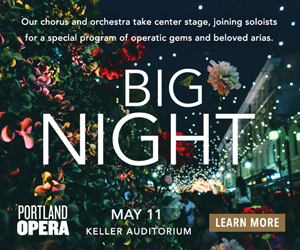 Portland Opera a la Carte. While the big splash will be with Così at the Newmark, the opera’s lean and adaptable touring troupe will be taking its act to the lawn of the Oregon City Public Library for a free show: three singers, one pianist, a menu of familiar arias, ensembles, and musical-theater tunes from which the audience can choose – or order. 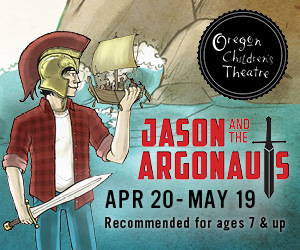 As the company says, “it’s essentially a food truck … that serves opera rather than tamales.” 1 p.m. Sunday, Carnegie Library, 606 John Adams St., Oregon City. Original Practice Shakespeare Festival. OPS, those feisty lads and lasses who bring a referee’s whistle and improv skills to the ritual of outdoor summer Shakespeare, adapt their skills to a little Julius Caesar Friday at Director Park and Saturday at Mt. Tabor Park, plus All’s Well That Ends Well Saturday at Mt. Tabor Park and Sunday at Columbia Park. The performers carry scrolls containing nothing but their own lines, so a down-on-his-luck actor can’t sell the full script to some unscrupulous theater manager across town. Rush Hour. Heidi Duckler Dance Theater/Northwest’s new piece plays out among an assemblage of cars, trucks, motorcycles, bicycles, and horse trailers, and works, says Duckler, “like a carnival” – you wander around the five ongoing stories being performed, stopping where you want and looping back, if you’re of a mind to, to one you’ve already seen. (You’re on your own, presumably, for cotton candy.) 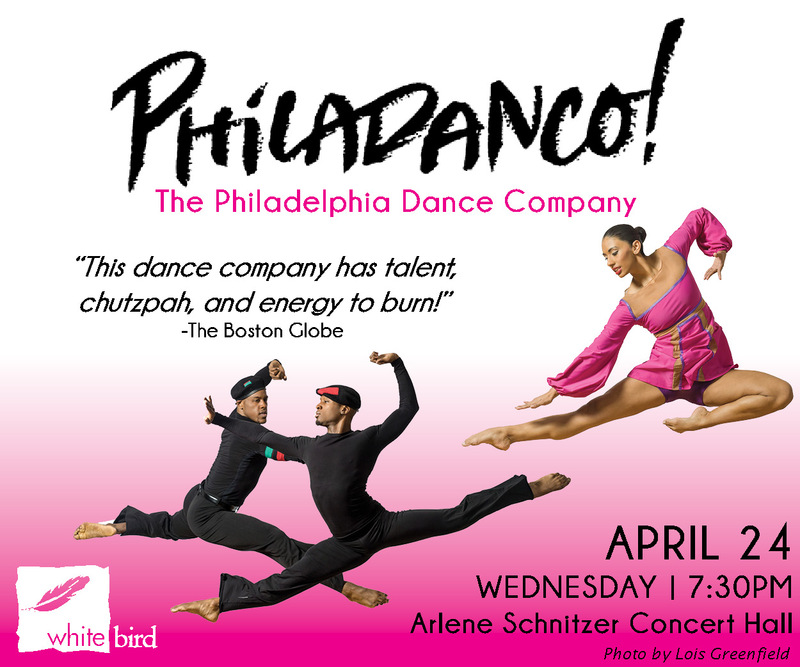 In addition to Duckler, the choreographers are Carla Mann, Conrad Kaczor, Kiel Moton, and Catherine Egan. 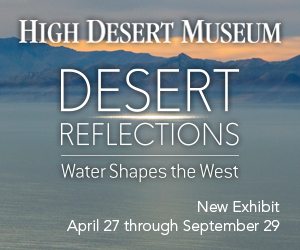 Saturday, Marine Artists Studios Northwest. Rantum Skoot. 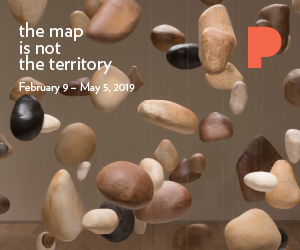 New works by the canny veteran dancer/choreographers Linda Austin and Gregg Bielemeier, plus visiting New Yorker Bon Eisen and the team of Sada Naegelin and Leah Wilmoth. “Rantum Skoot,” by the way, is a variation of “rantum scantum” – harum scarum, or disorderly. 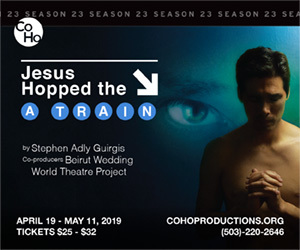 Friday and Saturday, Performance Works NW. The taiko masters of On Ensemble perform Friday at the Oregon Bach Festival. 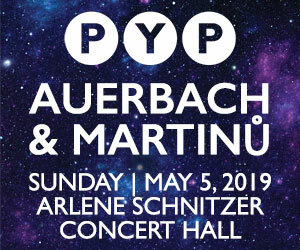 Danish keyboardist Lars Ulrik Mortensen leads the festival’s Berwick Academy players in an intimate concert at the University of Oregon’s Beall Concert Hall Thursday, when the academy’s emerging historically informed performers play a major work by the composer regarded in his time as Europe’s greatest. Nope, not J.S. Bach nor even Handel, but their friend Georg Philipp Telemann, who like several of his contemporaries wrote a couple of colorful pieces based on the characters in Cervantes’s then century-old immortal novel Don Quixote. 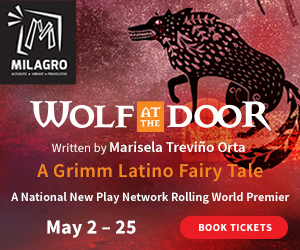 Telemann’s burlesque suite evokes the title character’s love for Dulcinea, his attack on those contentious windmills, his steed Rosinante, and Sancho Panza’s donkey, even his debt-caused thrashing and delusional dreams. 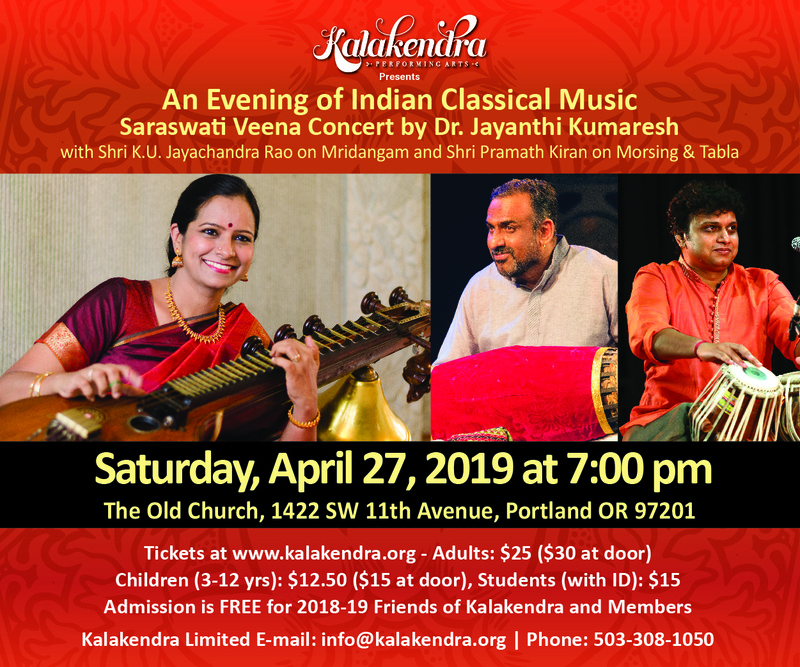 The concert also includes elegantly triumphant music from Zoroastre by one of the finest French baroque composers, Jean Philippe Rameau, and more. 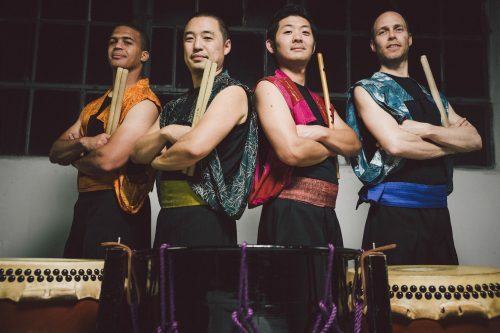 On Friday, the festival turns to global sounds and rhythms with LA’s On Ensemble, one of the West’s most prominent taiko groups. It’s a real fusion band, embellishing its basic Japanese taiko drumming with influences (jazz, Central Asian throat-singing, hip-hop, electronica) and even instruments (trap set, koto, frame drum, and more) from other cultures. Music director Matthew Halls, who had to detour to Toronto to be with his wife, Erin, for last week’s birth of their child, Henry, is back for the festival’s final week, including this Sunday’s closing Hult Center performance of one of the greatest of 19th century sacred choral-orchestral masterpieces, Beethoven’s Solemn Mass (Missa Solemnis), which the composer himself thought superior to his better-known Ninth Symphony. 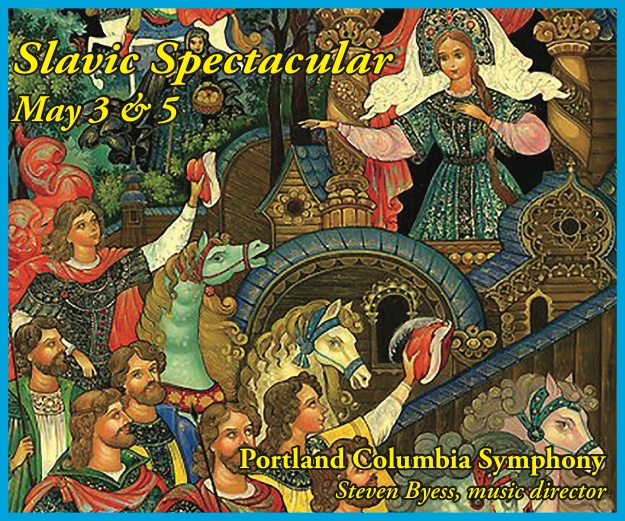 With a team of soloists led by the superb tenor Nicholas Phan plus the festival orchestra and chorus augmented by the University of Oregon Chamber Choir, it should even fill capacious Silva Hall. 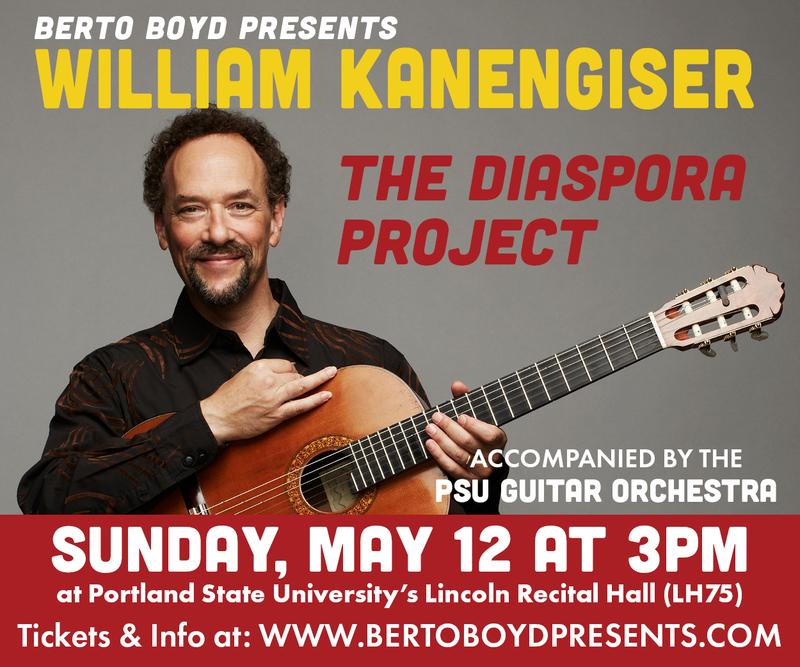 Tuesday-Sunday, Beall Concert Hall and Silva Concert Hall, Eugene. Wednesday through July 18, various venues. The venerable summer festival turns the focus to today’s female composers. Wednesday’s concert at Alberta Rose Theater spans the centuries, with Clara Schumann’s 19th century piano trio, early 20th century Anglo-American composer Rebecca Clarke’s impressionist-influenced viola and piano sonata, contemporary Scottish composer Helen Grime’s Three Whistler Miniatures, and one of today’s most engaging composers, California’s Gabriela Lena Frank (who you’ll be hearing more from around here next year). Thursday’s show at Reed College has a trio by another 19th century composer unfortunately overshadowed by a male relative, Fanny Mendelssohn, plus two of the festival’s commissioned world premieres, by emerging stars Kati Agócs and Hannah Lash, along with the classic inspiration for the latter’s new piece: Ravel’s gorgeous Introduction and Allegro. 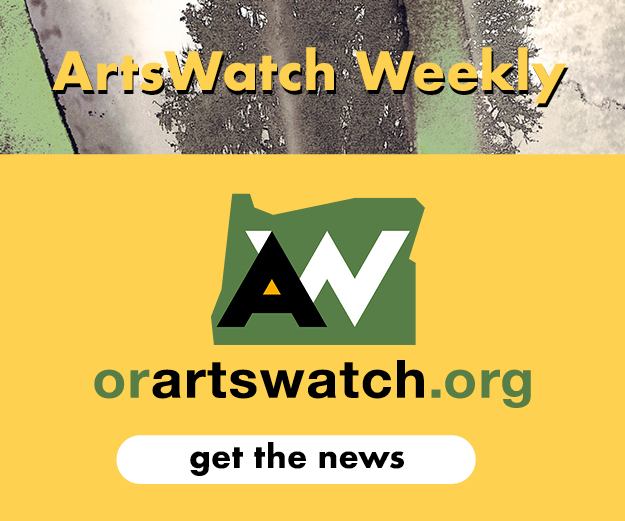 The two premieres repeat at Portland State on Friday, along with Portland composer Bonnie Miksch’s lovely, Korean-tinged Song of Sanshin (recently recorded by FearNoMusic) and Nokuthula Ngwenyama whirling viola solo Sonoran Storm. Those women and one of America’s most respected composers from the previous generation, award winner Joan Tower, gather at Reed for a panel discussion about their lives and music and issues facing female composers on Saturday afternoon. And Sunday‘s show at Reed features music by award winners Tower, Ellen Zwilich, Caroline Shaw and rising star Gabriella Smith. Old masters (Mozart, Haydn, Beethoven, Schumann) return Monday, played by excellent young quartets (Dover, Calidore) and veteran musicians. 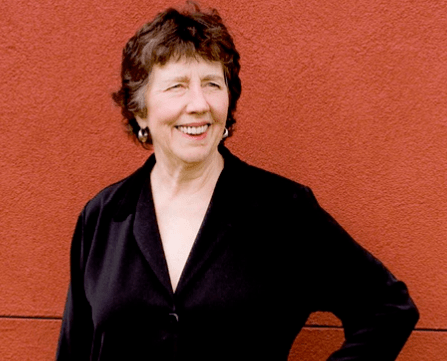 Prominent American composer Joan Tower talks Saturday at Chamber Music Northwest. 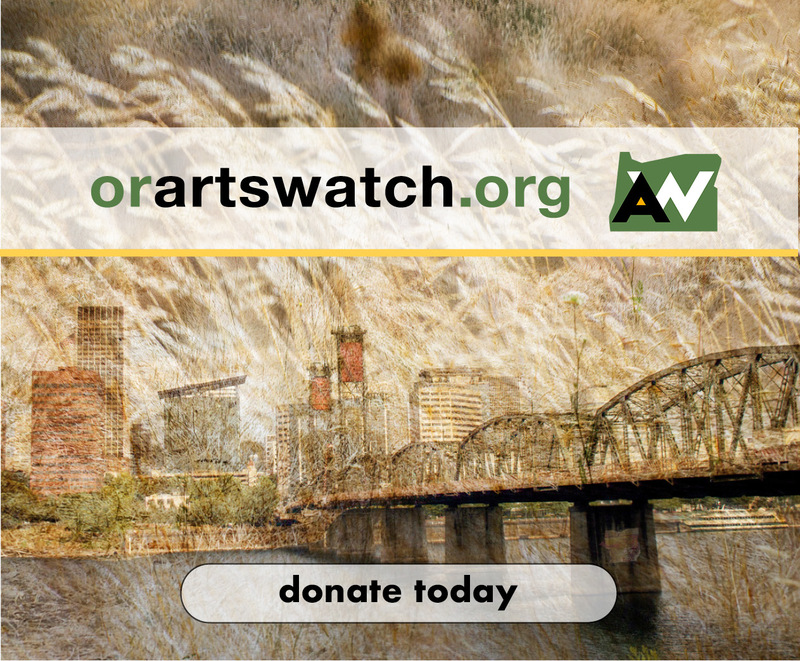 This new summer series with PDX Jazz makes an attractive match up of a pair of essential Portland institutions. On Tuesday, David Goldblatt Sextet performs movie themes for jazz ensemble. Tuesday, Lan Su Chinese Garden, 239 NW Everett Street. 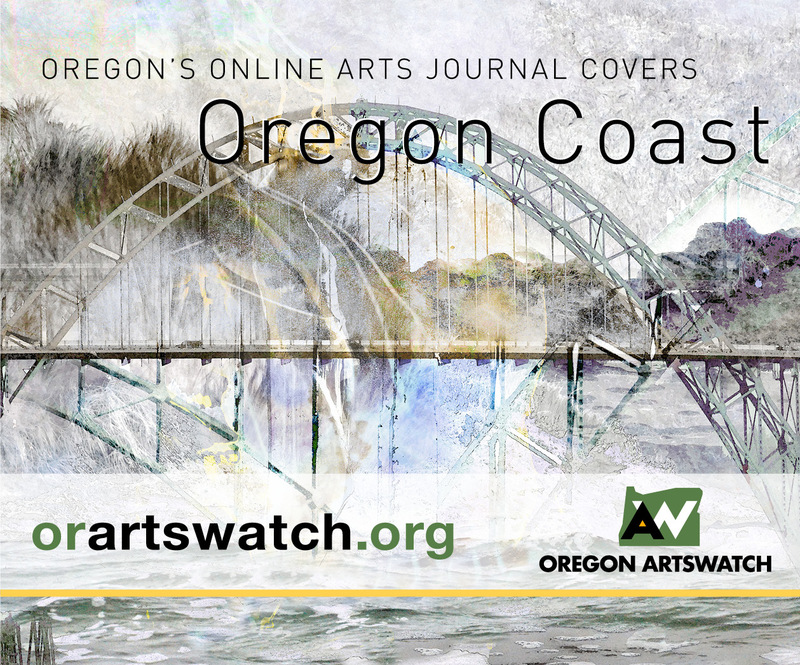 In the latest in Portland Piano International’s valuable Rising Star series, the emerging pianist plays music by Mozart, Debussy, Chopin, American ultramodernist composer Henry Cowell, and Oregon’s own Jay Derderian‘s new In the Tides I Break. 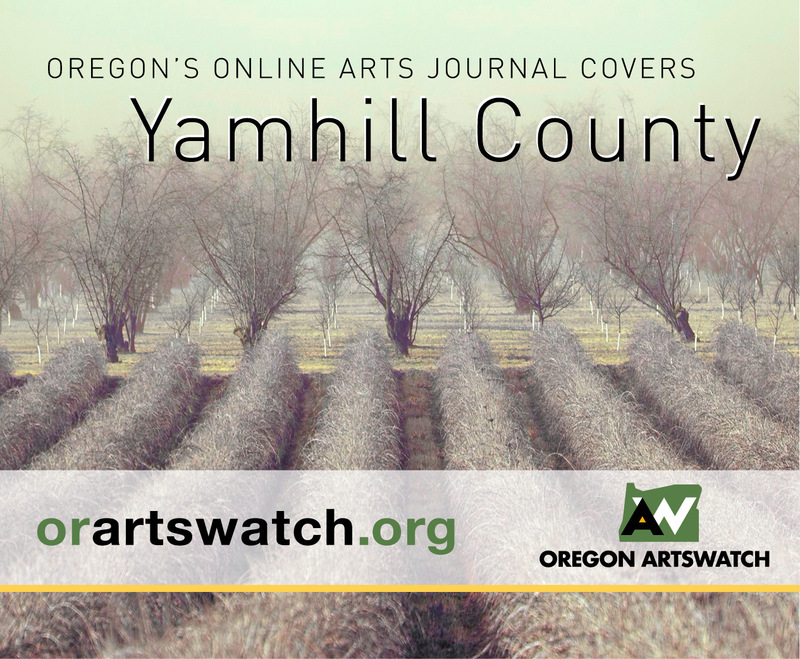 Thursday, Artists Repertory Theatre, 1515 SW Morrison St., Portland, and Sunday, Riverside Community Church, 317 State Street, Hood River. Portland Piano International brings Elisabeth Tsai to Portland and Hood River. In this free afternoon concert at the annual conference of the Oregon Music Teachers Association, the Portland/Seattle new music ensemble, conducted by OrchestraNext music director and University of Oregon prof Brian McWhorter, performs OMTA composer of the year Alexander Schwarzkopf’s new three-movement concerto for piano and chamber ensemble, which involves both improvisation and cross cultural influences. Friday, Chinook Winds Casino Resort, 1777 NW 44th St. Lincoln City. After 37 years, Portland’s oldest still-running jazz festival remains free, fun, and alfresco. 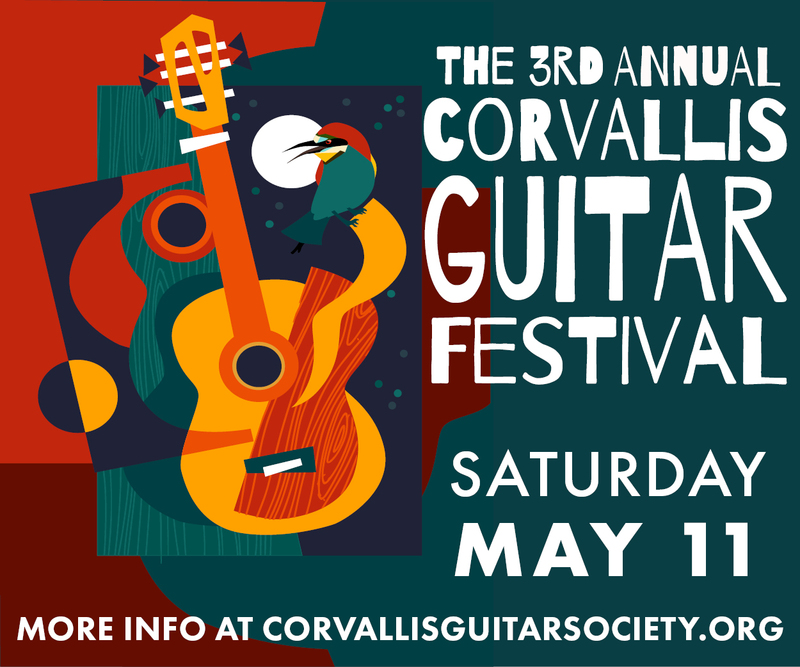 Friday’s show leans toward blues (Rose City Kings) and soul (Andy Stokes). Saturday afternoon features Marianna Thielen and pianist Reece Marshburn’s musical theater-style jazz with Bylines Quartet, followed by Midnight Serenaders’s Hawaiian-tinged retro swing. 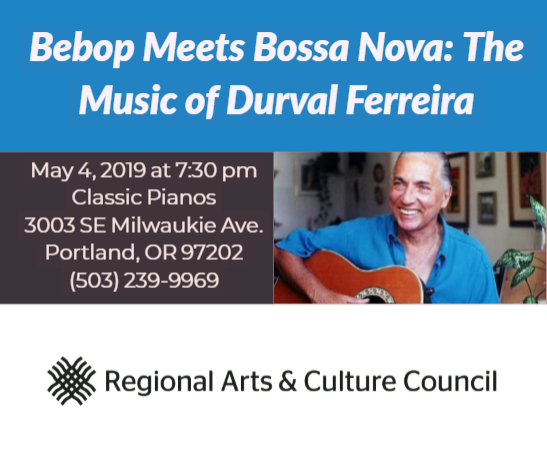 Singer Shirley Nanette’s quartet with tenor sax champ Renata Caranto opens the evening stretch, which continues with Cuban pianist Manuel Valera’s Trio’s new Latin jazz, and veteran Portland soul man Ural Thomas and the Pain. On Sunday, Portland Youth Jazz Orchestra Vanguard Alumni Band brings together members from 16 years along with high school musicians to play jazz classics, followed by two of Portland’s top jazz composers, Clay Giberson (whose quartet performs at 2:30) and Ezra Weiss (whose Big Band plays at 4). Harmonica virtuoso Joe Powers pays tribute to his mentor, the late, great Toots Thielemans, in the opening evening set, and the festival concludes with the funky jazz-soul of Michael Beatzilla Whitmore & The Store of Funk. Cathedral Park, Friday-Sunday. The sound of glass ceilings shattering. Chamber Music Northwest’s season is emphasizing the music (both old and new) of women composers, and the remarkable thing about it is that it’s remarkable: Even now, most music on most programs from most organizations is by men. Brett Campbell looks at the present and future as the classical world slowly begins to open up to the work of women and women of color. UNA Gallery and Y.G.B., asserting the community. Hannah Krafcik has the lowdown on two Portland collectives that are creating space for the city’s black, femme, and queer communities. Making old music new. 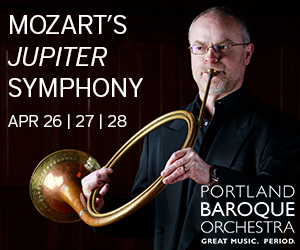 Concerts by the Portland Columbia Symphony Orchestra and the Oregon Symphony take different approaches to freshening old works for new audiences (and new works for old audiences), Matthew Andrews writes. Plus, how about that P.D.Q. Bach and al the Looney Toons laughs? Cabaret: the darkness behind the razzle-dazzle. Brett Campbell explains why Bob Fosse’s compelling movie adaptation outstrips the stage musical it was based on.